Practice being appreciative with a partner. 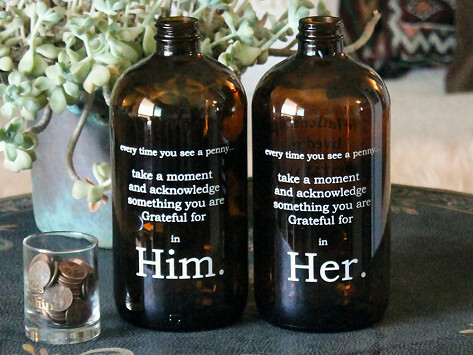 This pair of printed glass gratitude jars encourages you both to pause and be thankful—and they do it beautifully. Fill them up with loving notes. 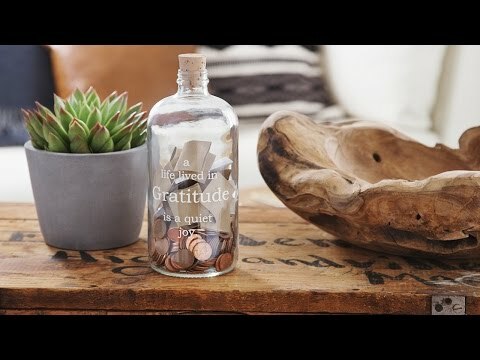 Or, next time you find a penny or some spare change, take a second to note your blessings as you drop it into the jar. As you watch the jars fill up, you’ll build a habit that helps you each focus on the positive things in your life—including each other. Dimensions of each jar: 10.5" x 10.75" x 4.25"
Weight of each jar: 1.4 lbs. Using as a small, thoughtful, and loving pre-wedding gift for my daughter and future son-in-law. Whenever I give these as gifts, they are received with enthusiasm and excitement! Everyone loves them!